Last Saturday, the annual “Free Iran Conference” took place in Paris, France. There was a turnout of around 100,000 in attendance this year, standing up to support the possibility of a free, Democratic governed Iran. The Gateway Pundit calls the convention the biggest of its kind in the entire world. The Gateway Pundit’s own Jim Hoft was in attendance at the conference this year. The conference’s bipartisan American coalition was led by President Trump’s personal lawyer and former New York Mayor Rudy Giuliani and former Republican Speaker of the House Newt Gingrich. News came out on the Monday following the conference that what was described only as a “Belgian” couple with Iranian ties were arrested after planning a bombing attack on the conference. German Police took a third suspect into custody for alleged ties to the planned attack. The suspect was an Iranian diplomat at the country’s embassy in Vienna. The diplomat/would be terrorist is named Asdollah Assadi, and he is said to be the leader of the planned terrorist plot. It was reported by the Gateway Pundit that the diplomat is employed at the Iranian Embassy located in Austria. He was taken into custody in Germany by German Police. We have now learned that the Iranian embassy official provided the bomb to the “Belgian” couple for the would-be attack. 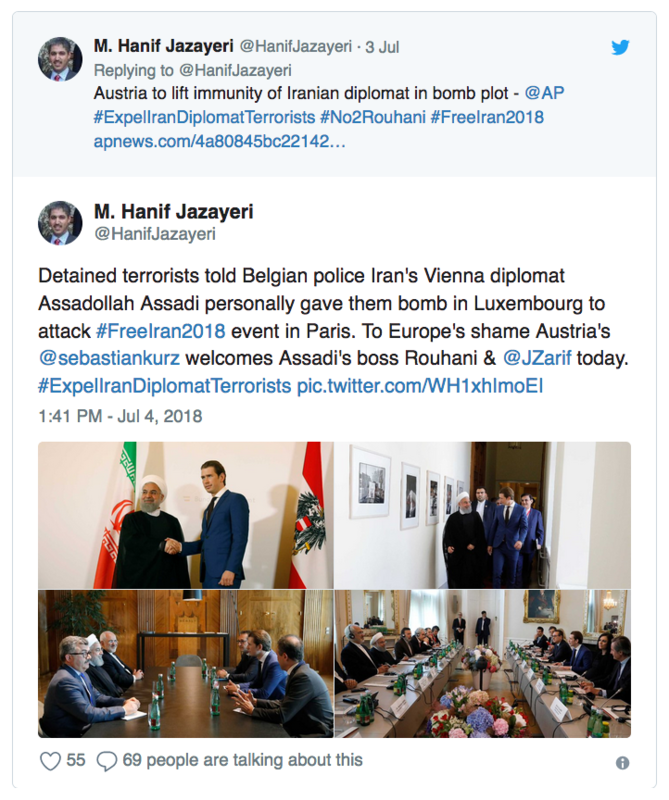 Austria is preparing to strip the diplomatic immunity from an Iranian envoy suspected of planning to bomb Iranian politicians in France. The diplomat and two other arrested people are suspected of plotting to attack a meeting of exiled opposition members in Paris last weekend. The diplomatic tension comes a day before President Hassan Rouhani is due to arrive in Austria to discuss a disputed nuclear deal. Two Belgian nationals apprehended in Brussels are reported to be husband and wife, and to be of Iranian origin. Reporters were told by the Iranian foreign ministry’s spokesman, Bahram Qassemi, that his nation had evidence proving that the attack was planned by a known terrorist group. “The latest scenario has been planned and carried out to damage Iran-Europe ties amid such sensitive and crucial times,” he stated.